More About – What’s in the Bag? 1. Good Stuff In: Making sure that the quantity and type of feeds that go into your horse’s digestive system are appropriate for a forage eater and that the combination of feed sources you provide meet the balanced nutritional requirements necessary to maintain a healthy body and mind. 2. Bad Stuff Out: Taking care to limit your horse’s intake of anything toxic or inappropriate for a forage eater that will burden or overload the digestive system and lead to illness and physical/emotional distress. Whole foods naturally provide enzymes, which are key to digestion. These enzymes initiate the process of digestion in the mouth and stomach, essentially helping the horse to predigest food so that the digestive system is less taxed and stressed. Unfortunately, feeds that have been processed, heavily refined and/or pelletized lack these critical enzymes that live in all growing plants and seeds (the horse’s natural diet) because the processing kills enzymes. 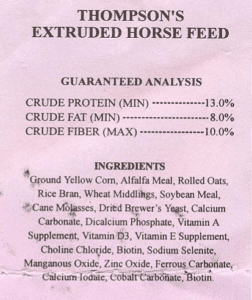 When we feed our horses these processed feeds it increases stress on the GI tract. This stress becomes cumulative with continued use over time, leading to a wide variety of illnesses, injuries and behavioral abnormalities. Let’s have a look at some ingredients of popular feeds. Commercial feeds have been and still are very popular. They are readily available, easy to portion, just rip open the bag, measure out a scoop or two and you are done. Wheat Middlings, Cane Molasses, Dried Plain Beet Pulp, Soybean Oil, Dehulled Soybean Meal, Corn Distillers Dried Grains with Solubles, Dehydrated Alfalfa Meal, Soybean Hulls, Salt, Calcium Carbonate, Yeast Culture, Rice Bran, Dicalcium Phosphate, Monocalcium Phosphate, Calcium Propionate (a preservative), Magnesium Oxide, L-Lysine, Ascorbic Acid, Vitamin E Supplement, Zinc Methionine Complex, Manganese Methionine Complex, Copper Lysine Complex, Cobalt Glucoheptonate, Natural and Artificial Flavors Added, DL- Methionine, Selenium Yeast, Dried Bifidobacterium thermophilum Fermentation Product, Dried Enterococcus faecium Fermentation Product, Dried Lactobacillus acidophilus Fermentation Product, Dried Lactobacillus casei Fermentation Product, Biotin, Vitamin A Supplement, Copper Sulfate, Zinc Oxide, Vitamin D3 Supplement, Vitamin B12 Supplement, Riboflavin Supplement, Folic Acid, Thiamine Mononitrate, Manganous Oxide, Manganese Sulfate, Ferrous Sulfate, Ferrous Carbonate, Copper Chloride, Zinc Sulfate, Ethylenediamine Dihydroiodide, Calcium Iodate, Cobalt Carbonate, Sodium Selenite. Let’s have a look at these. Wheat Middlings—Grains are sorted and graded at the processing plant, with the superior grains going to human consumption and lower-rated grains are set aside for animal feed. The byproducts of these grains, one of which is wheat middlings, become cheap fillers for horse feed. Today most of our wheat is genetically modified or sprayed with glyphosate just a few days before harvesting, as this speeds up the ripening process. Glyphosate is the active ingredient of Round-up, a known carcinogen. Glyphosate is supposed to have a very low toxicity to mammals, but toxins are accumulative in the body. They will sit and fester, until there are enough toxins to wreak havoc on your health. Wheat middlings are found in most feeds. Cane Molasses— this is added as a binder and for palatability, as the wheat middlings and other ingredients are usually dusty and often carry a bitter taste. To make the horses eat these ingredients, molasses is added. In the production of molasses sulfur dioxide is added which extends the shelf life among other useful, but also harmful processes. Sulfur dioxide is a pollutant and a primary component of acid rain. Dried Plain Beet Pulp— is a low-cost by-product of the sugar beet industry that is commonly used as a fiber source in animal diets. While it is a reasonable feed product in terms of protein (10%) and digestibility, the sugar in sugar beets gets often extracted with the use of the chemical hexane and hexane residue leads to the toxin burden in your animal. 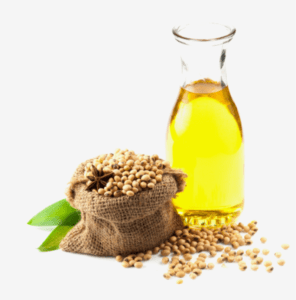 Soybean Oil— besides the fact that most soy in the USA id genetically modified, Dr. Mercola points out that soy bean oil is a completely unnatural man-made fat created through the partial hydrogenation process, which causes dysfunction and chaos in your (and your horse’s) body on a cellular level. Studies of this hydrogenated oil have found links to cancer, diabetes, decreased immune function etc. Furthermore Goitrogens, found in all unfermented soy whether it’s organic or not, are substances that block the synthesis of thyroid hormones and interfere with iodine metabolism, thereby interfering with thyroid function. Dehulled Soybean Meal— see notes about soy in the previous paragraph. Corn Distillers Dried Grains with Solubles— Distiller grains are a byproduct of the manufacture of ethanol, with the massive amount of GMO corn grown in the USA to support that industry. When, during the production, the mash is warmed up and infused with yeast, it often becomes contaminated with bacteria. Instead of producing alcohol, these bacteria leave behind lactic acid. This lowers the ethanol yield, so ethanol producers solve this problem by infusing the mash with antibiotics. Yes, antibiotics. Dehydrated Alfalfa Meal— Most alfalfa growers use the GMO variety and this is then again heavily sprayed with herbicides and pesticides to produce a better yield. No, these toxins do not wash off. They go with the plant into your horse’s system, stressing the immune system and adding to the toxicity in his system. 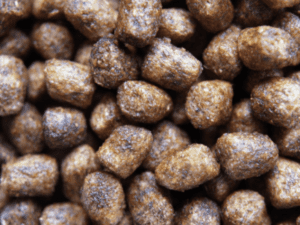 Natural and Artificial Flavors Added— The Association of American Feed Control Officials (AAFCO) allows pet food companies to call MSG “natural flavors”. MSG overstimulates the nervous system and can cause an inflammatory response. Because it can overexcite cells to the point of damage, it is called an excitotoxin. 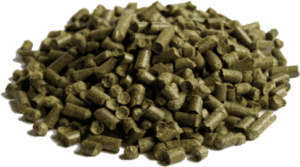 Pelletized or extruded feeds— both require extreme processing and heating, which destroys vitamins and minerals. In the pelleting process, the mineral and vitamin mixes, usually a synthetic form, are sprayed onto the pellets or added afterwards. Look at the label on a bag of Cool Stance and you will see only one ingredient listed: coconut (copra) meal. This ingredient is a whole food, which means it contains the natural enzymes needed to aid digestion and that its nutrients are more bioavailable. You might be wondering, “Isn’t the coconut meal in Cool Stance processed?” The answer is no, at least not the way other horse feeds are. The coconut meal used in Cool Stance is simply dried under low heat. It is not cooked under the high heat used to process and pelletize other commercial feeds. The copra meal is dried simply to prepare it for packaging and the heat used is carefully monitored to make sure it is not high enough to destroy nutrients and enzymes. Occasionally people suggest that Cool Stance may not be a good choice because it’s not a “complete feed”. The truth is, it’s precisely because Cool Stance has not been altered into a processed “complete feed” that it is so unique and special! 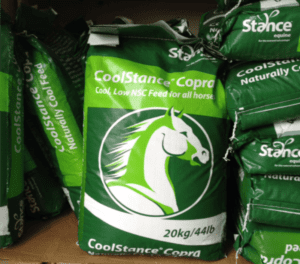 The copra meal in Cool Stance has not been compromised by high heat that breaks down enzymes and nutrients nor has it been supplemented with chemical or synthetic vitamins and minerals. Copra (coconut) meal is naturally packed full of many key nutrients needed for superior health (equine, canine, human, etc.) 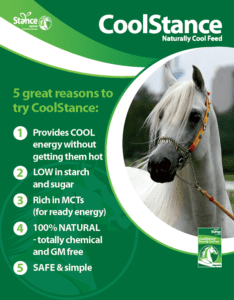 – and these nutrients come in an easily digestible, highfiber, whole food form for horses in Cool Stance. Feeding your horse WELL is now as easy as providing adequate natural forage (grass hay or pasture) and finding a Cool Stance retailer near you. After that, simply choose a high quality vitamin/mineral supplement to ensure a proper balance of key nutrients needed for horse health… then sit back and relax knowing you are providing your horse everything it needs to thrive, and nothing that causes digestive stress or harm! P.S. An added benefit of using a free-standing vitamin/mineral supplement instead of a “complete feed” is that you can adjust the amount of feed (Cool Stance) based on each horse’s energy/ fat and protein needs, but still know you are providing the right amount of vitamins and minerals. With “complete feeds” you always have to feed the recommended amount in order to provide the proper balance of vitamins and minerals. Want to get more details about equine nutrition and what you can feed to help your horse? “Whole Food for Horses by Tigger Montague” is an excellent book and available on our webpage.